At the heart of everything we do is the ambition to be the market leader in the design and delivery of sustainable homes, apartments and mixed-used communities. In essence, this means that we want to improve the quality of life for people, and the communities they live in. Of course our work has a big impact on the environment, and the communities in which people live and work. We want that impact to be positive. So we are committed to go about our work in a way that minimises the environmental impact of our operations and maximises the social and economic benefits for local communities. The Government has set a target of zero carbon emissions from all new builds. This has in turn lead to a revolution in building methods. And at Hodson Developments we are at the forefront, pioneering the use of new construction techniques, materials and technologies. 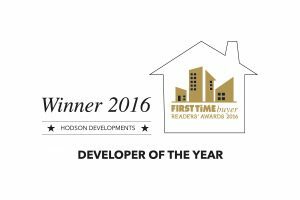 We want Hodson Developments to be acknowledged as an industry leader in this area for years to come. So we have even set ourselves a sustainability objective; to ensure that every development we do is delivered in an environmentally responsible and sustainable manner. Whether we are regenerating existing neighbourhoods, or creating new homes, apartments and communities, we engage with our stakeholders to develop sustainable places with their own distinctive character and identity. What does ‘sustainability’ mean to Hodson Developments? For Hodson Developments, sustainability is about balancing and supporting socio-economic and environmental considerations, both in what we build and the way that we build it. This includes creating long-lasting communities, providing sustainable transport links, delivering high-quality homes and apartments, the responsible sourcing of materials, energy efficiency and supporting local economies. Sustainability at Hodson Developments is led from the top, with a well-established governance framework that supports our continuing work to integrate sustainability across the business and in our decision-making. Our sustainability policies provide clear direction for the management team and employees. These are reviewed annually by our Senior Directors for impact and application. We recognise that our procurement decisions have environmental and social consequences too. We are committed to wherever possible specify sustainable materials, and to work with our supply chain to promote social responsibility and environmental stewardship. One of our key commodities is timber. Forests play a critical part in the wellbeing of people, nature and the planet. So we must ensure that the procurement decisions we make proactively support ethical and sustainable timber products and responsible producers and suppliers. We commit to only buying timber from known legal sources and seek out suppliers and subcontractors that are certified to trade in Forest Stewardship Council (FSC) timber. All our sites also take part in the Considerate Constructors Scheme (CCS). We adhere to the principles of considerate construction practice and good neighbourliness on all sites. We continue to manage the construction process to help to minimise the environmental impact of its operations and reduce potential for pollution of soil, water and air. We minimise the waste generated and encourage the appropriate re-use or recycling of materials as far as is practicable. We encourage the procurement of materials that are produced in a manner that causes less impact on the environment. We investigate opportunities, and where appropriate implement measures, to ensure that natural resources are used efficiently. A brand new home is four times more energy efficient than an older one, on average. Improved insulation in walls and floors and robust windows and doors help keep out the draughts and retain the warmth. Modern central heating systems reduce the amount of energy used to heat the home, which not only helps save on carbon emissions but can lead to lower fuel bills too. We also make sure each development is designed carefully to blend in with its local environment and to maximise natural light within the home. This helps avoid an over reliance on additional lighting, with a corresponding reduction in energy consumption.